FOR YEARS: 2008, 2009, 2010, 2011, 2012, 2013, 2014 (2012). MON - FRI 9AM-6PM. OUR REF: 1451-08041916115303. Wheel speed Sensor. parking assist Sensor. Lambda(Oxygen) Sensor. 1 X Wheel Speed Sensor. NUMBER PLATE LIGHT. Exhaust System. Fits to the following models. Number of ports: 2. Part number: WHT003863. We are breaking a 2015 Seat Ibiza Toca 6J MK4 (Facelift 1ST). Paint Colour: Blanco Candy White. Shelf location: 2a14. Paint Code: LB9A. 1.4 (1390cc) Petrol 84.5 BHP 5 Door Hatchback 5 Speed Manual RHD. Fitting Position: Rear Axle; Fitting Position: Right. Model year to: 05/2015; Fitting Position: Rear Axle; Fitting Position: Right. Model year to: 04/2015; Fitting Position: Rear Axle; Fitting Position: Right. Brake Systems from Bosch. A vehicle’s braking system is one of the most important safety systems in a vehicle. Drivers depend on their braking system to perform in every situation. It is only as strong as its weakest point, therefore there is no room for compromise. Item Specifics:2008-2017 - 1.2 PETROL - ABS PUMP / MODULATOR. Part:ABS Pump/Modulator. This ABS Pump/Modulator was removed from a2015 car and has been fully inspected. An ABS sensor is fitted to each wheel of a vehicle equipped with an ABS system. The sensor itself is linked to an ABS Ring, which is fitted to the brake rotor. Both of which work to help prevent the car from skidding under heavy braking. SEAT LEON SC (5F5) 2.0 TDI Coupe Diesel 02/2013 on FWD 16 150 110. SEAT Mii (KF1) 1.0 Hatchback Petrol 10/2011 on FWD 12 60 44. SEAT LEON ST (5F8) 2.0 TDI 4Drive Estate Diesel 04/2014 on AWD 16 150 110. 2015 SEAT IBIZA. This has been taken from a 2015 IBIZA but may suit other models. Model: IBIZA Door Plan: 3 Door. Year: 2015 Fuel Type: Petrol. ABS Pump/Modulator. ABS: Unknown Engine Code: CGGB. Lambda Sensors. Lambda probes & sensors. Lucas Oxygen Sensor. Delphi Oxygen Sensors. Bosch Oxygen Sensors. Denso Oxygen Sensors. NTK NGK Oxygen Sensors. Fitting Depth22 mm. 1 X Wheel Speed Sensor. United Kingdom. United Kingdom(from Germany). Extend the service life of the car. Rest of The World. Directly replace(OE/OEM) number E.U. countries. Sensor Type Hall Sensor. AUDI 6Q0 927 808 B. AUDI WHT 003 862. PART NUMBERS 6R0614117T 0265237040. 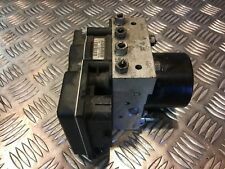 2011 SEAT IBIZA ABS Pump/Modulator. This item has been removed from a: 2011 SEAT IBIZA. Model: IBIZA. Part Type: ABS Pump/Modulator. Make: SEAT. Year: 2011. Fuel type: Diesel. PART NUMBERS 6R0614117T 0265237040 ( ). 2010 SEAT IBIZA ABS Pump/Modulator. This item has been removed from a: 2010 SEAT IBIZA. Model: IBIZA. Part Type: ABS Pump/Modulator. Make: SEAT. Fuel type: Petrol. Part Number 6R0614517AJ. Factor Number: 6R0614517AJ. 2013 SEAT IBIZA ABS Pump/Modulator. This item has been removed from a: 2013 SEAT IBIZA. Model: IBIZA. Part Type: ABS Pump/Modulator. Make: SEAT. Year: 2013. PART NUMBERS 6R0614117T ( ). 2011 SEAT IBIZA ABS Pump/Modulator. This item has been removed from a: 2011 SEAT IBIZA. Model: IBIZA. Part Type: ABS Pump/Modulator. Make: SEAT. Year: 2011. Fuel type: Petrol.